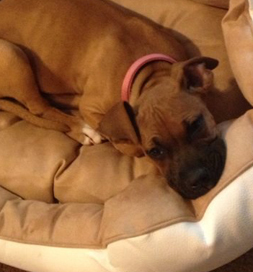 Happy Tail: Boxer puppy is saved! The tiny Boxer-mix puppy was tied to a post “out in the middle of nowhere,” says Kaylee Stout, her new “mom.” The sun was beating down on the pup, and “a woman and her daughter watched for a while and nobody ever came back to get her.” The pair intervened and took her to Randolph County Animal Shelter in Elkins, WV. Read the story in Kaylee’s words. Kaylee and her husband, Scottie, have three other dogs, so she wasn’t really looking for a fourth one, but the pup’s story was enough to capture Kaylee’s attention when she saw it on Petfinder. Kaylee named her Scarlett and says that the four-month old puppy is a real cuddler. “She loves it outside, but as soon as she is inside, she is curled up on the couch beside me.” She and one of the Stouts’ other dogs, Jacey, have become best friends. Scarlett was lucky that the mother and daughter noticed her and came to her rescue. She could have easily succumbed to the summer heat. We all need to be on the look-out for signs of neglect and abuse and report them.